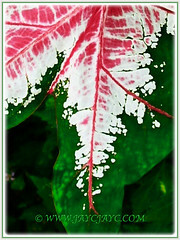 The Caladium Rosebud has eye-catching, bright green foliage with bright pink centres and edged by jagged white. It makes a wonderful contrast against its green foliage. The Rose Bud Caladium will definitely light up a shady area of your garden. It is grown for their amazingly vibrant, beautifully patterned and heart-shaped leaves, not for their flowers. A charming foliage plant for all season! Common Names:Rose Bud Caladium, Fancy Leaf Caladium, Angel Wings, Elephant Ears. Etymology: The genus name, Caladium is coined for taro (edible starchy corms) on the basis of the Malay word, keladi. Origin: Native to South America and Central America. They are naturalised in India, parts of Africa and various Tropical Islands. Plant type: An ornamental, herbaceous and perennial tropical plant, but an annual in temperate regions. Features: Caladium Rosebud is a species of the genus Caladium that comprises of about 7 species of flowering plants.This enchanting Rose Bud Caladium can scale to a height between 50-60cm and spread as wide. 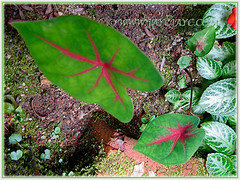 It is grown not for their flowers but for their amazingly vibrant, beautifully patterned and heart-shaped leaves that are borne on long petioles which arise directly from the underground tuber. 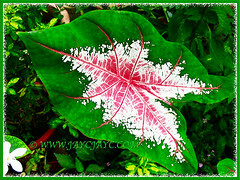 It has distinctive colours on their bright-green leaves with splashes of deep pink veins and edged by jagged white. Magnificent and splashy tri-coloured foliage to enjoy! 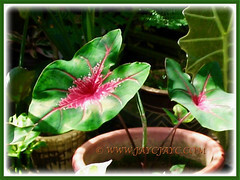 Caladium Rosebud may bloom, producing a single arum-type flower with a green or pinkish spathe surrounding a short white spadix. Fruits are white berries with several seeds. 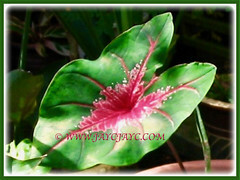 Culture (Care): Caladium Rosebud can be easily grown with minimum care. Light: Best with filtered sun or partial shade. It can tolerate full shade. Full sunlight will scorch their foliage. Others: Remove withered leaves and petioles. Provide adequate warmth and humidity. If the Caladium Rosebud blooms, it is best to remove the inflorescence since it takes away energy from the plant that otherwise would be used to produce more leaves or a bigger tuber. Take note that all parts of the plant are poisonous and should not be ingested as they may irritate sensitive skin. For subtropical and temperate regions: Hardiness: USDA Zone 9a – 11. Caladium Rosebud is a frost tender perennial. In temperate areas, they should be lifted before the first frost and planted as houseplants. The tubers should be dried and stored for the winter when temperatures fall to 18°C, and stored moderately dry over the winter at temperatures between 13°C and 16°C. They are tender perennials, therefore should be lifted from borders or pots moved in autumn, stored in a frost-free place over winter and planted out again in spring. Start tubers in the early spring, keep warm, moist and away from sun. It has a dormant period which is self-induced from time to time. 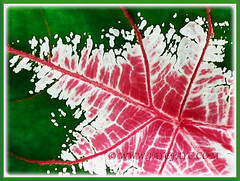 Usage: Caladium Rosebud is sure to make a stunning statement in any shady area of your garden. Use it to add colour and texture in shade gardens. Ideal to be grown in containers for decks and patios or grounded in beds and borders. These colourful plants can be used as ground covers in shady location.